← Advisory Committees on the chopping block • An opportunity in disguise? A year ago I wrote a blog post about Route 35, one of Toronto’s longest north/south bikelanes. It starts up at St Clair and runs south along St George and Beverly, all the way to Queen – and then abruptly ends at a T-intersection. The big question is: How do we connect this beautiful bike lane with the downtown core and the waterfront? Right now, the best option for cyclists is to cut east (either through the Grange Park, or along Stephanie) and use John Street as the southbound route. This is ideal for a few reasons. John is a fairly wide street and can easily accommodate bike traffic. More importantly, John Street provides the only north/south signalised intersection for cyclist – anywhere between Augusta and Victoria. But in the long-term, John is imperfect for cyclists. It’s frequently closed down for special events (like Much Music concerts), and there’s also a plan to re-design the entire road with an emphasis on wider sidewalks, narrower street width and more on-street events. So, where should Route 35 cross Queen? 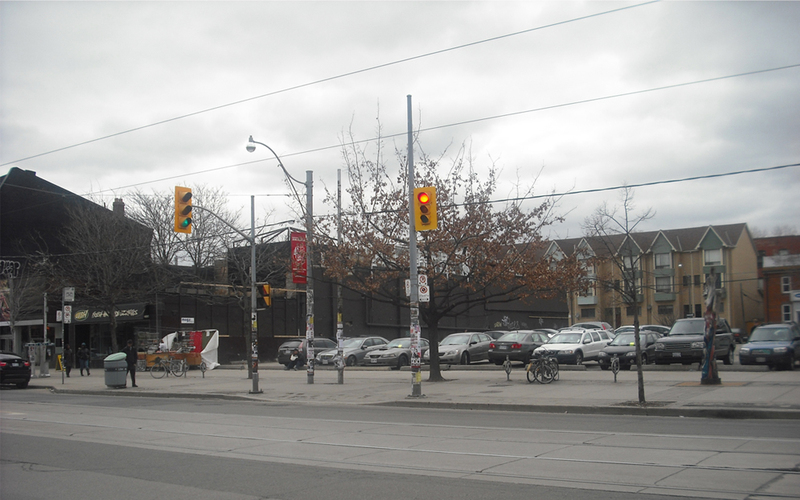 One options is Simcoe, but that would require a new traffic signal at Queen and a complicated laneway route along Renfrew Place to connect to Beverly – which is 4 blocks away. The other option is Peter Street. This would require a much shorter detour from Beverly: along Phoebe, over to Soho and then across Queen to Peter. The problem with this solution is that there is a jog at Queen Street, forcing cyclists to maneuver across the intersection on an angle, through stopped cars and over streetcar tracks. This would require some minor expropriation (or re-parceling) of the parking lot, and would create a new public square outside the Black Bull. Taking out the jog would create a wonderful north/south crossing point and would be the safest way to cross the streetcar tracks. But if that isn’t possible, we should at least re-configure the streetlights. Currently, they are placed at the top of Peter Street, and cars end up blocking Soho when they stop at a red light (despite the sign that says “Do Not Block Intersection”). If we move the lights to the east, then cars will stop east of Soho leaving the entire intersection open for cyclists traveling north/south. But what about something even more creative? Maybe we can create a safe crossing point – without re-aligning the intersection. I came across this photo recently, of a bike lane in Holland that travels right underneath a building! This approach could open up endless possibilities, not just for Peter Street but for bike lanes across Toronto that lack connectivity to other lanes. 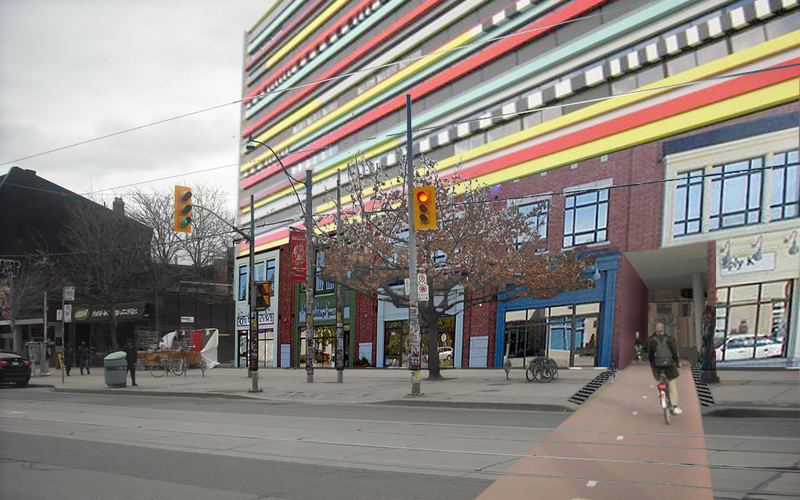 Each time we develop a new property downtown, we should be looking at innovative ways to ensure that the building design could also contribute to sustainable transportation needs in the area. …. and dropping the Holland building on top! And before I get in trouble for setting a bad example for cyclists, let’s change that red light to a green light! If we’re going to make the downtown core work for cyclists, we’re going to have to find creative solutions. On May 3rd, one thousand Bixi bikes are going to appear on our downtown streets. But with hardly any bikelanes in the central core, where are people going to ride? Experienced cyclists can navigate a major street without bikelanes, but the whole point of Bixi is to try and get people who aren’t avid cyclists to give two wheels a whirl. If that’s going to happen, we’ll need to make sure there are safe routes to ride. Let’s get bold, creative and ambitious and make space for dedicated bike lanes all across the city. This entry was posted in Bikes are Beautiful, Community Organising, I Have Too Much Time on my Hands, The City is Beautiful, Whose Space is Public Space?. Bookmark the permalink. This looks great Mez! 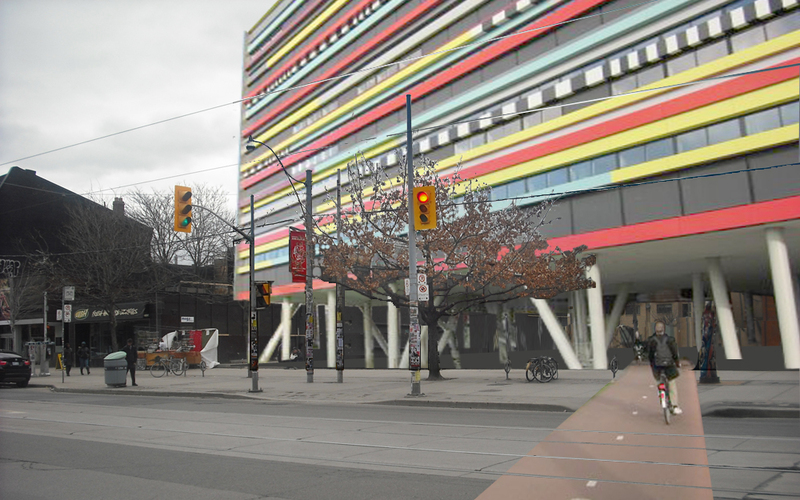 The city would also have to make Phoebe St. 2-way, and perhaps turn the X-walk at Beverley/Phoebe into a light? That parking lot is such a wasted opportunity, it’d be great if it could be put to better use. Rerouting Soho through it doesn’t seem like a bad idea at all. I can’t agree with the idea of separating the lights to either side of Peter and Soho though. Anything that isn’t two streets meeting at right angles seems to violate too many users’ mental model of how to behave at an intersection. Look at Mt. Pleasant & Lawrence, or even the 3-way stop at Sussex and St. George. The other quibble is with the idea of a bike tunnel. 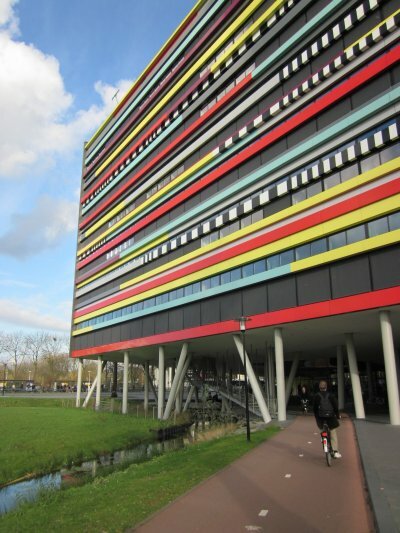 I think it works in the Dutch original because it looks fairly open (that building reminds me of the pencil box). I think a narrow tunnel, especially that close to clubland is risky for all kinds of reasons. I believe there are plans to make that parking lot into a public square, (or are those illegal in English Canada?) Perhaps you should send your idea to Adam Vaughan and see if it fits in with the plan. Hey Michael! I don’t believe there are any plans for a public square at that location. My understanding is that the parking lot will be developed into a commercial building with ground floor retail. Adam Vaughan wasn’t much of a fan of Squares when he voted to support RioCan at YE. 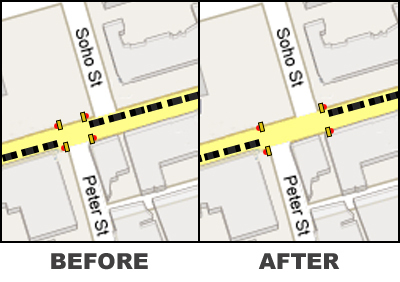 I love the idea of curving Soho to meet the end of Peter Street, but the solution of moving the traffic lights to incorporate Soho into the signalized intersection is really a no-brainer, even if it is a short-term solution. 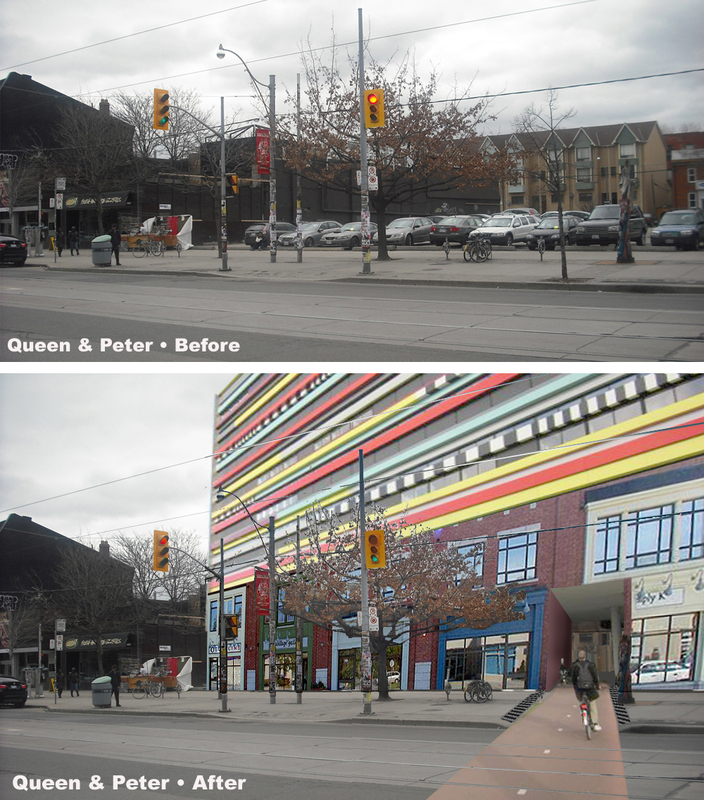 Take the three-phase intersection of Queen St East and Wineva Ave as an example. 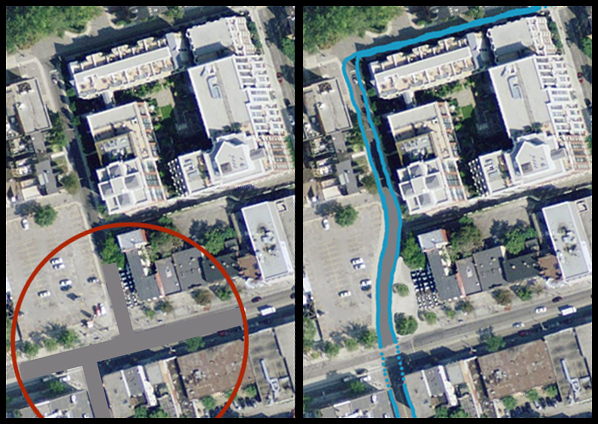 It works, and I think the dimensions of the roads are very close to the same as the Queen West/Peter/Soho intersection. I love these ideas! I take the route almost every day and usually go through the park to John. 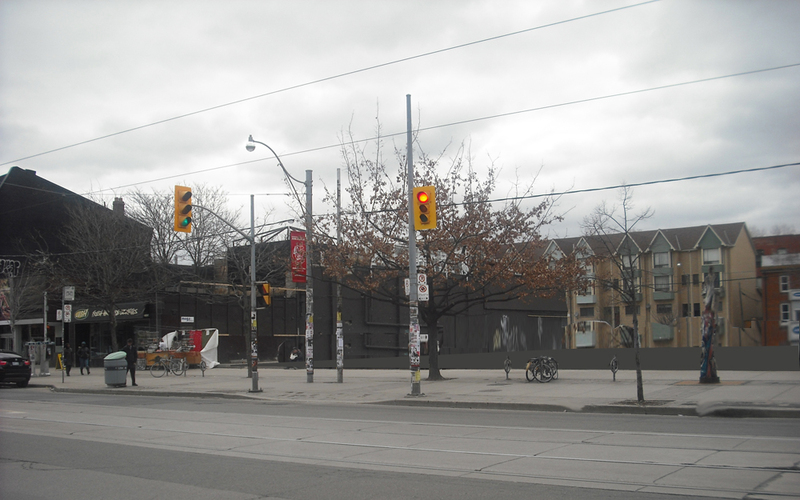 I can’t think of too many people who would complain if the Black Bull got more patio space. Mez’ solution to the crossing at Queen actually falls into traffic engineering best practices. This is what’s called an ‘offset intersection’ and spacing traffic signals farther apart makes them safer. If you follow Route 35 to Midtown Toronto, there’s another offset intersection nearby (at Heath and Yonge) which is slated for signal reconfiguration this year.